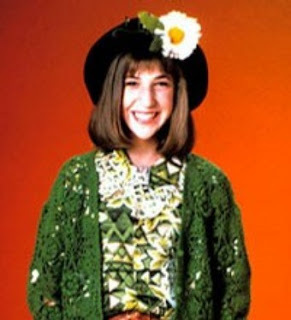 I gave you the hint: Think Mayim Bialik, Blossom of early 90s TV fame. Well, if you watched that show at all, you would have noticed that she wore a lot of hats. And they all had big flowers on them. Ok, so we're not going to be that crazy. But we are going to take some inspiration from this cutesy teenager from the 90s - because she is awesome! 1) Cut a long strip of main fabric. Make sure it fits around your head and has enough of a band. 2) Cut a smaller strip (same length) of the second fabric. 4) Cut out a piece to fit in the top. Sew it on sorta backwards to make pretty zig sag stitching on outside. 5) Make a pretty flower with a pretty button in the centre. Sew it on. Voila! Don't I look cute? And it's wonderfully warm and comfy. I again want to keep it for myself. 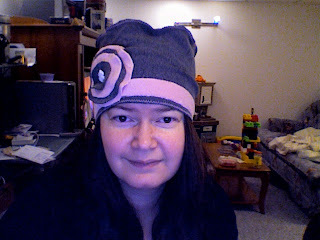 But I shall sell this one and make another one for myself when I'm finished with all these projects.